Aliens in the Water – All Eyes on Deck! What alien invasive species has been detected in Revelstoke Lake Reservoir? If you answered Quagga and/or Zebra Mussels you’d be wrong. But if you answered C — Eurasian Milfoil — you’d be the big winner. Last autumn, the Columbia Shuswap Invasive Species Society completed invasive plant and mussel detection surveys in high priority lakes in the North Columbia. 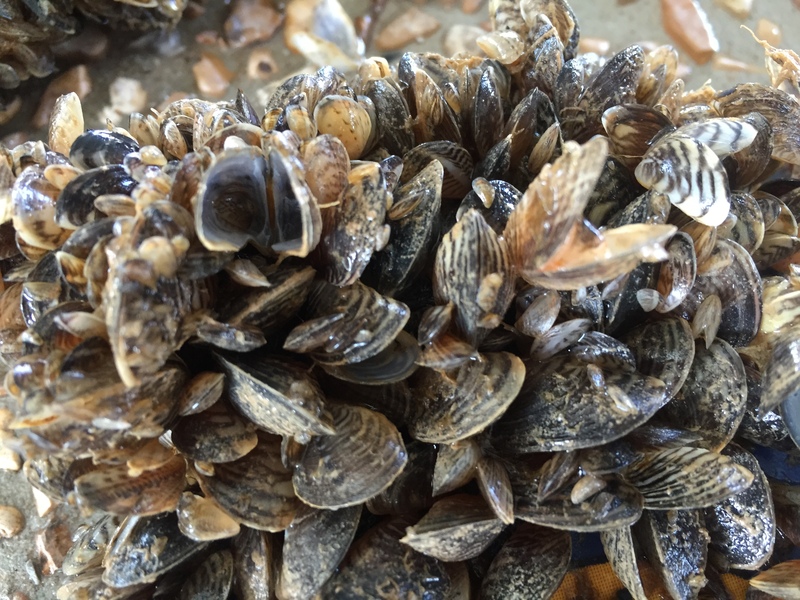 To date, the analyses from Lake Kinbasket, Lake Revelstoke, The Upper Arrow reservoir, and the Columbia River all came back negative for Zebra and Quagga Mussels. However, invasive Eurasian Water Milfoil was detected in Lake Revelstoke, near the Martha Creek Provincial Park boat launch. Our surveys confirmed earlier studies by BC Hydro and the Ministry of Forests, Lands, and Natural Resource Operations that originally found this site infestation. Invasive milfoil and invasive mussels take over riparian and recreational water areas, making it dangerous and difficult for swimmers and native aquatic life. 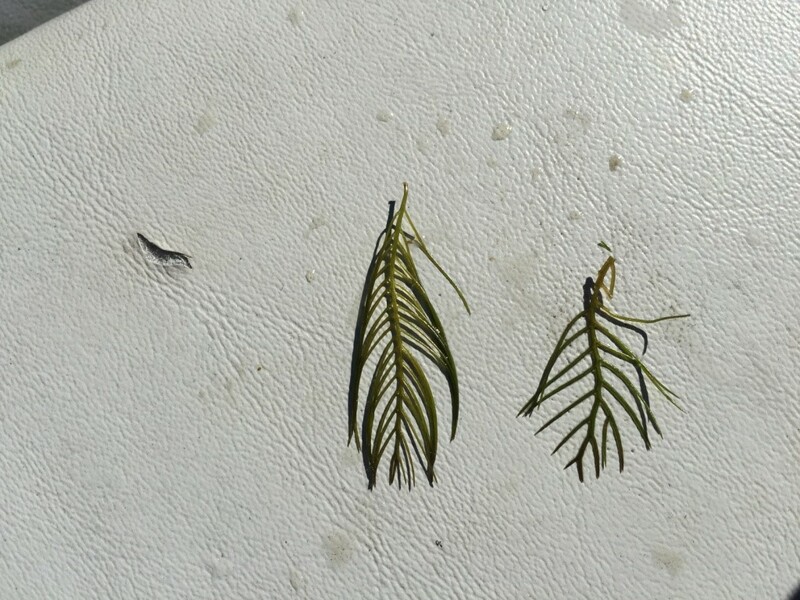 Eurasian Water Milfoil is found throughout the Shuswap Lake region, and the CSRD runs a program funded by Shuswap residents to manage milfoil infestations at public recreational areas. The Columbia Shuswap Invasive Species is working with the appropriate jurisdictions and stakeholders regarding a strategy for the Eurasian Milfoil infestation in Lake Revelstoke, under the guidance of the Canadian Columbia Basin Aquatic Invasive Species Framework. 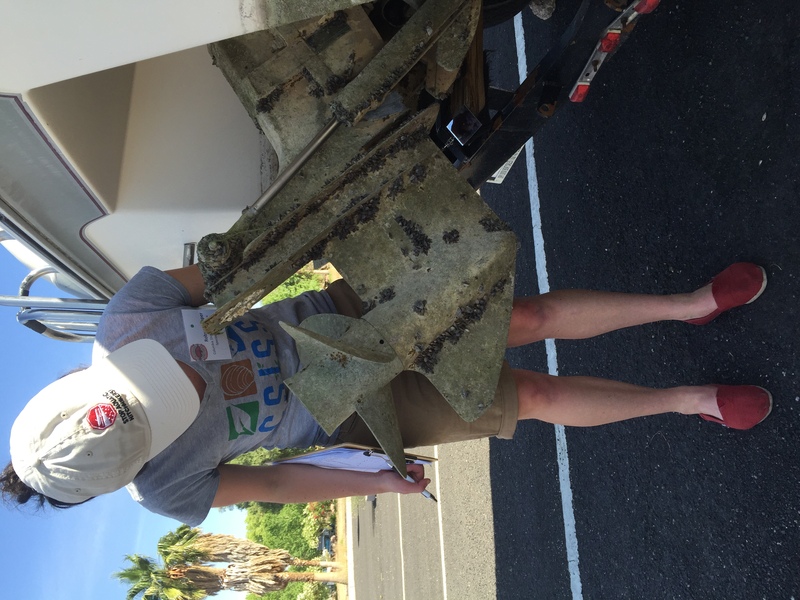 CSISS is planning more invasive plant and mussel detection surveys for 2016, and is excited to have Laura Gaster back with the CSISS staff team as the new Aquatic Invasive Species Program Coordinator this spring. Images (from Left to Right): 1. 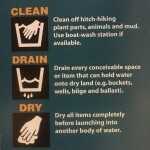 Clean Drain Dry Instructions for Watercraft Users (ISCBC), 2. 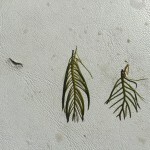 Eurasian and Native Milfoil (H.Kassa), 3. 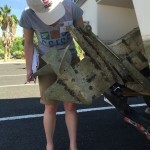 Inspecting a Boat Motor Infested with Quagga Mussels in Lake Mead (CSISS), and 4. 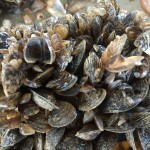 Quagga Mussels in Lake Mead (CSISS). The Columbia Shuswap Invasive Species Society is a non-profit organization dedicated to the prevention, management and reduction of invasive species in the Columbia Shuswap Regional District. CSISS is thankful for the generous support of the Columbia Basin Trust, the Columbia Shuswap Regional District, the Ministry of Forests, Lands and Natural Resource Operations, and the Ministry of Transportation and Infrastructure. For more information on the 2015 invasive plant and mussel surveys, take a look at the CSISS North Columbia Priority Aquatic Invasive Species Surveys 2015 Report. 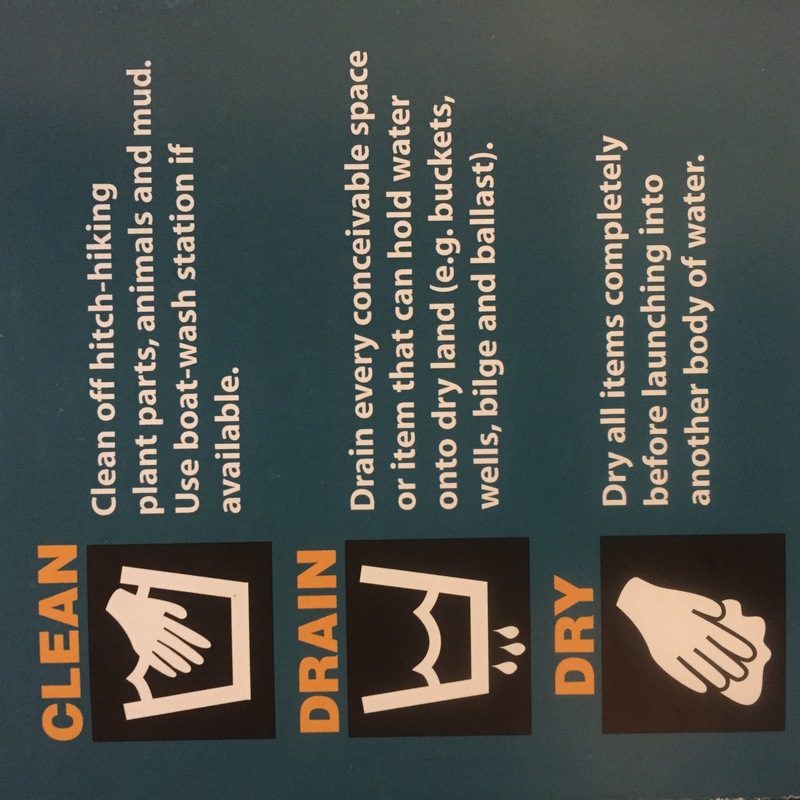 Learn about where to properly clean your watercraft and what waterbodies in Eastern Canada and the Southern United States are infested in our Boat Decontamination and Wash Locations brochure. BC Hydro Columbia River Project Water Use Plan: KINBASKET RESERVOIR FISH & WILDLIFE INFORMATION PLAN Reference: CLBMON-55. Revelstoke Reservoir Macrophyte Assessment – Phase 1 Study Period: July 2009 – October 2010. G3 Consulting Ltd. (Note: page 51-52 Invasive Species). Appendices. BC Hydro. Columbia River Project Water Use Plan Kinbasket Reservoir Fish & Wildlife Information Plan. Revelstoke Reservoir Macrophyte Assessment Implementation Year 2 Reference: CLBMON-55.Revelstoke Reservoir Macrophyte Assessment – Phase 2. Study Period: September 2014 to October 2014. G3 Consulting Ltd.